It was only on July 3rd that the advance south was finally renewed. But before St Lô itself could be attacked there were several other obstacles that needed to be removed. 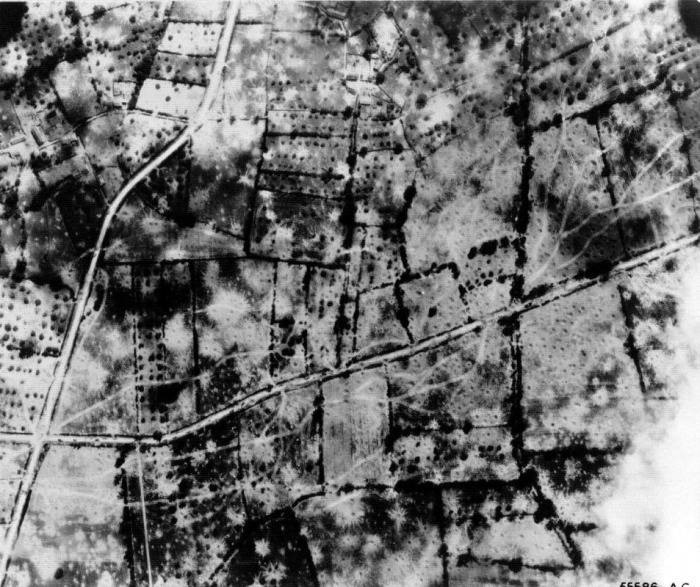 The western flank of the American line facing the town was far to the north, only just south of Carentan with a lot of swampy, flooded ground between them and their target, and the entire eastern flank of the American line was under German observation from the enemy held heights of Hill 192, five miles (8km) to the east. 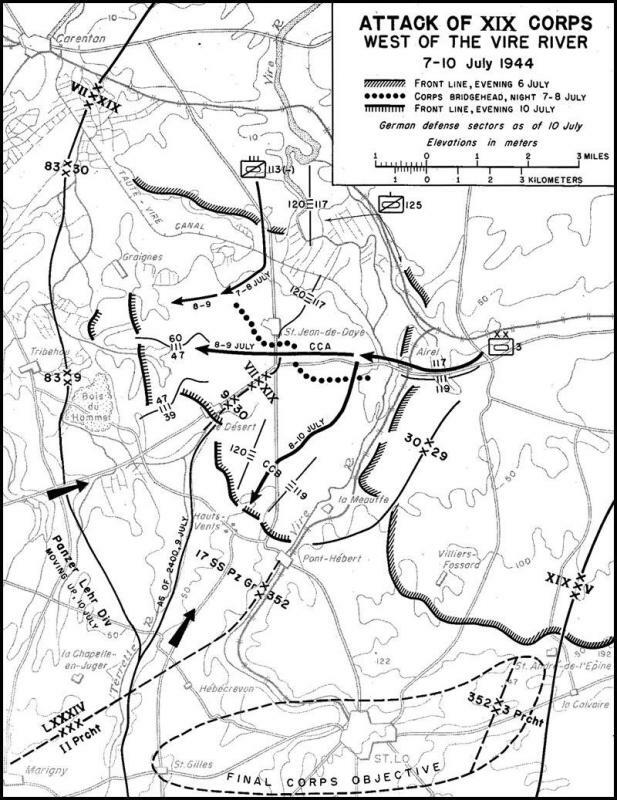 It was only directly north and east of St Lô that the US 29th Infantry Division had pushed its advance to within 2 miles (3km) of the town. Before the town could be captured and its road network opened up, these two issues would have to be resolved. The countryside the American forces had to attack through was a patchwork of small fields surrounded by thick earthen embankments with large hedgerows growing on top, all of which made defense easier and attack more difficult. The Germans had used the previous two weeks of inaction to construct strong defenses and when the American Army resumed its attacks south they soon ran into stiff resistance. But the US soldiers had learned a lot about hedgerow fighting since they had landed in June, and new techniques were being employed to help the troops, such as the 'Cullin Hedgerow Cutter' to help the tanks break through the hedgerows, as well as better and closer co-ordination of Air-support for the ground troops. Although progress was slow, it was steady and the Germans were gradually squeezed back. The fighting in Normandy's western sector soon degenerated into a series of huge individual firefights, with few soldiers being able to see more that one hundred meters in any direction, if that. It was countryside who's geography favoured the defender; where an overwhelming superiority in tanks, armour and aircraft did not significantly alter the balance of power; where the best individual soldier or small group of soldiers won. This led to savage, close quarter fighting, where gains per day were measured in hundreds of yards, where the slightest rise in the ground could be a strategic goal worth hundreds of lives for the observation position it could give over enemy positions. You will be shown actual German and American firing positions during this fighting, drive and walk the hedgerow laneways for yourself, see the temporary bridges put up by the US Engineers to accommodate the huge volumes of military traffic that are still being used by the French today, as well as the earthworks carried out by both sides of the conflict and the damage inflicted on the small, sleepy Norman towns. Located about five miles (eight kilometers) north-east of St Lô, this rise in the ground would hardly be classed a hill on most maps. But in a countryside where a significant high point is twenty or thirty meters (sixty-five to one hundred feet) above the surrounding countryside, Hill 192, named for its height in meters, was a strategic point that would cost a lot in American lives. From here, the Germans had an uninterrupted view north over the 2nd Division's lines, but also west overlooking all the approach paths that would have to be used by the 29th Division's attack to capture the town. 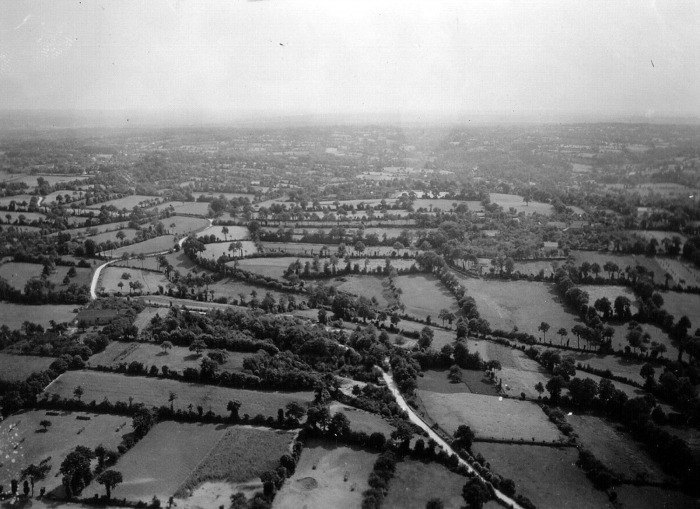 Following a savage fight on the 11th of July, the 2nd Infantry Division finally secured this high ground allowing the capture of St Lô five days later. Here you will be shown the American and German front line positions at the start of the battle, with the Germans everywhere looking down on the US soldiers. 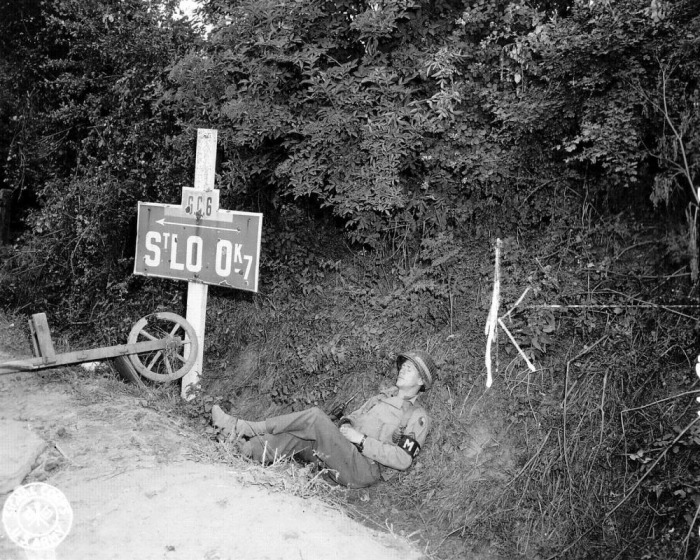 You will be driven down to 'Purple Heart Draw”, so named for the cost in lives to the 23rd Regiment who had to clean the Germans out of there to secure the left flank of the attack and then on up the back of the hill along the paths used by the 38th Regiment in their fight to reach the summit. A short walk from the car at the end of the path will impress you with the panoramic view down to St Lô to the west. The ground you will be looking at is ground that had to fought over by the 29th Division to get into the town and the importance of Hill 122 to the US First Army in capturing St Lô will be clear for you to see yourself. The US Forces started to push south into the German front lines from Carentan on July 3rd and also started attacks to push forces into the German eastern flank over the River Bridge at Airel, about ten miles (16km) north of St Lô (see Map "XIX Corps west of the Vire 7-10 July 1944"). 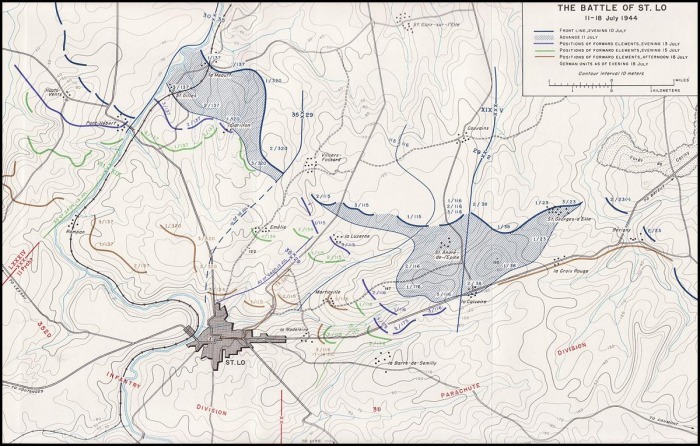 You will be shown the German front line positions along the river and where the US Armoured Division assembled before the attacked kicked-off over the vital river bridge at Airel. 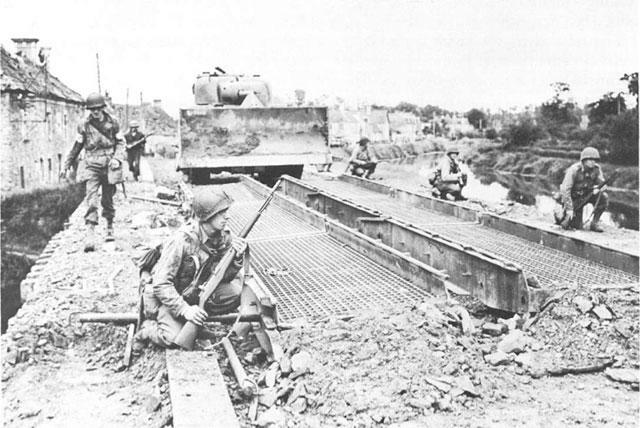 You will hear the story of how the bridge was kept open by the American Combat Engineers despite German efforts to destroy this bottle-neck to the US advance route. You will be driven along the road taken by the 3rd Armoured Division as they pushed the Germans back to the important road junction in the village of St Jean de Daye. Here, once in possession of this crucial crossroads, the tanks were able turn left to start the push south with the US VIII Corps coming down the on the western flank in support. Once this had started, when the right flank had pushed down to the north-western outskirts of the town, and with Hill 192 in American hands and the left flank secure, the 29th Division could finally finish the job that they had waited 3 weeks to do- Capture St Lô itself. 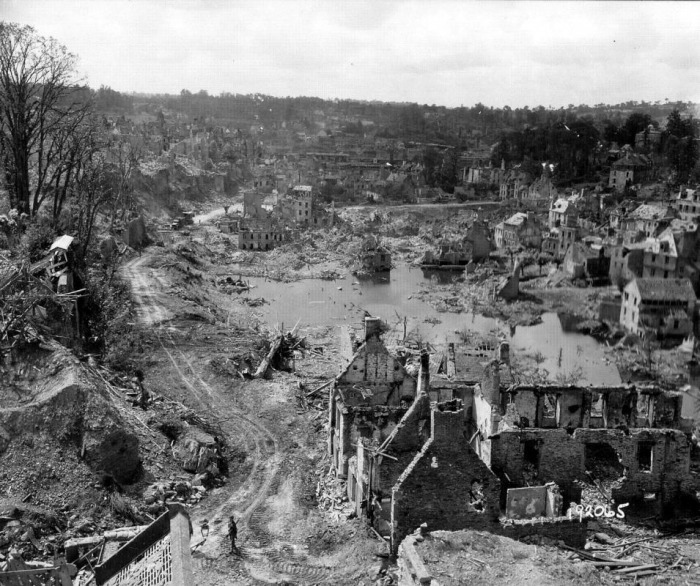 The town of St Lô in the west of the landing zones was as important to the Americans as the town of Caen was to the Anglo/Canadian Forces in the east. 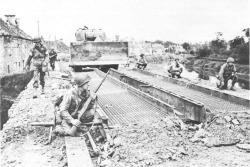 Both towns were the main crossroad towns into Normandy through which all major road led. Without these towns and the road networks they give access to, the Allied Armies were going nowhere. 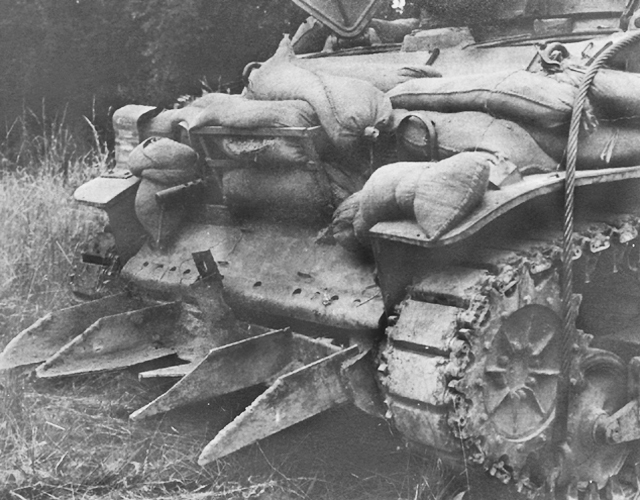 The Germans recognized this and set up most of their Armoured forces around Caen where the open countryside better suited their armour protection and longer range of their guns. The forces used by the Germans for the defense of St Lô were the 3rd Parachute Division and the 352nd Infantry Division. The German Parachute divisions were the elite infantry units of the German Army, showing the importance the attached to the defense of St Lô. SS units were not used as all the SS formations were armoured and the terrain around the town did not lend itself to armoured warfare. Experts in camoflague and trained to operate in small groups or alone, the German Paratroopers used the hedgerow terrain expertly to their advantage and did everything in their power to exact a heavy price from the Americans for every meter of ground captured. 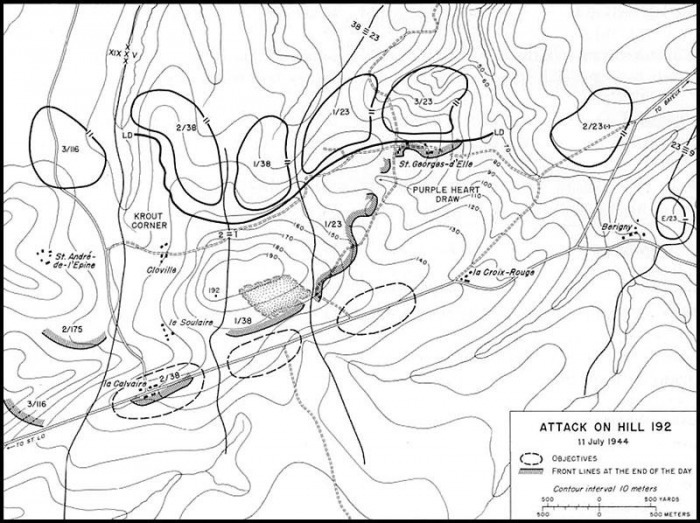 Here you will see Hill 122, the other point of high ground directly north of St Lô that had to be captured by the American 35th Infantry to secure the right flank of the attack to be carried out by the US 29th Division, you will be driven along the advance routes taken by the attacking force, you will be shown the church in St Lô where the body of Major Howie, “The Major of St Lô”, was lain by his troops following their successful capture of the town, and the signs of the damage inflicted during the fighting here in July of 1944. 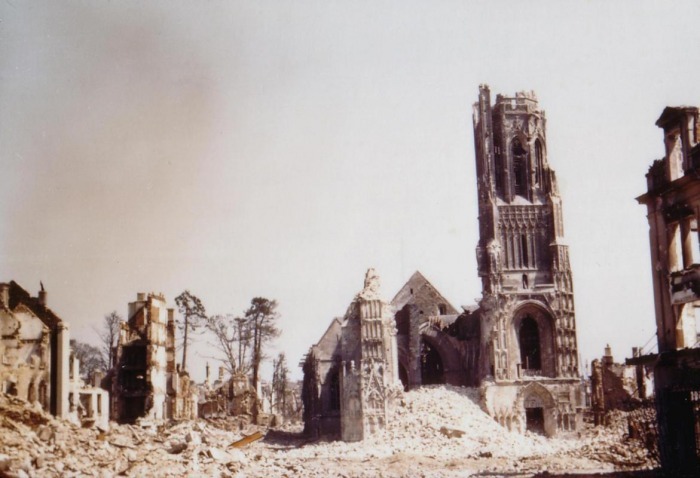 The church was heavily damaged during the fighting here in 1944 but when it was repaired after the war the repairs were done in such a way as to make sure that the war-time damage would be there for all time to see. 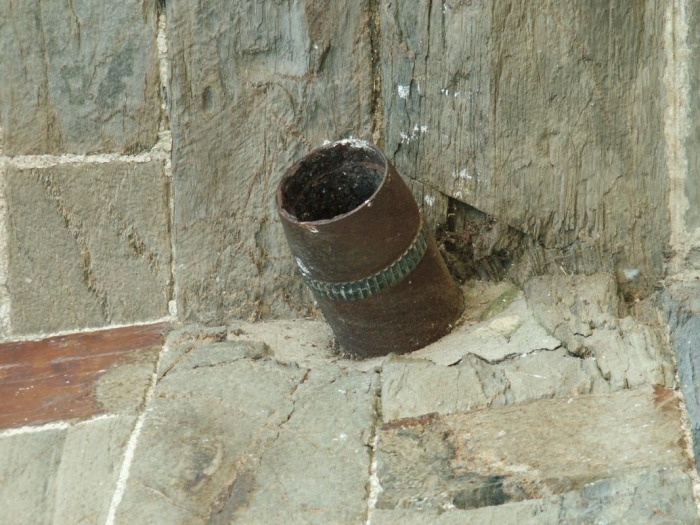 You will see the 'dud' 155mm (6-inch) American Artilley shell which had hit the church wall and embedded itself but failed to explode in 1944. It was removed to de defused and deactivated but was replaced again afterwards. You will also be shown the World War One memorial statue which still shows the bullet holes and shrapnel pock marks left during the savage fighting that took place here during the Second World War. Finally, you can see the huge Plaque to the dead of the Battle of St Lô suitably placed just above the entrance to the massive underground German bunkers built beneath the medieval castle in the town center.